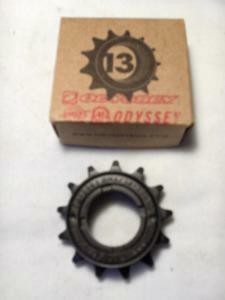 13 Tooth Freewheel Sprocket 1/2" x 1/8". ODYSSEY Brand. 30 mm x 1.0 or 30mm x 1.0 CW - right hand threads. Use 410 chain 1/2" pitch x 1/8" width.